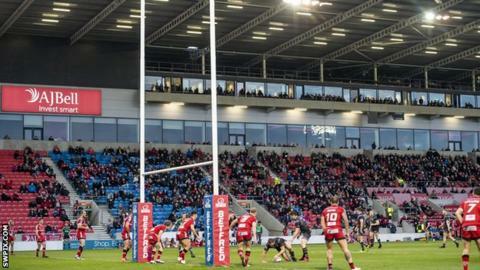 Salford Red Devils have invited the victims of a racist graffiti attack as guests of honour at their home fixture against St Helens on 28 February. A man was arrested on suspicion of racially aggravated criminal damage after David Yamba, 10, found "No Blacks" painted on doors at his home. Chief executive Ian Blease tweeted to Yamba's father that he wanted to show the "true community of Salford". "We're really looking forward to it as a club to get them down," Blease said. Speaking to BBC Radio Manchester, he continued: "When I read about it on Sunday before our game against Leeds, I was absolutely appalled. I've worked around those areas of Salford my whole life so I know what it's like and I know it's tough. Salford have won two of their three games this season and are currently fourth in the Super League table. "Having a family of my own, my heart went out to his son and I thought I need to do something here as we're a community club," Blease added. "I thought what better gesture than getting him down and showing them rugby league? Jackson Hastings came on board saying 'let him walk out with me down the tunnel'. "It's genuinely not a PR stunt, we just want to help because we feel for them."